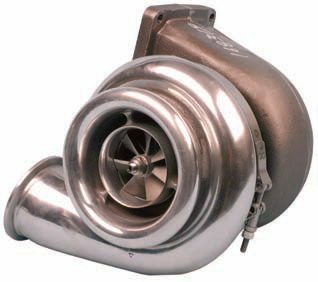 Forced induction, through the use of a turbocharger or a supercharger, forces additional air to the intake charge This forced air is referred to as boost. This creates higher cylinder pressure, allowing the engine to produce more power. By contrast, a naturally aspirated engine uses available (ambient) air to enter the engine, mix with fuel, and ignite in the combustion chamber. When I talk about forced induction, I’m referring to either supercharging or turbocharging. The purpose of either system is to pack more air into the engine than is available under normal atmospheric pressure. Atmospheric pressure is 14.7 psi (at sea level). If a turbocharger or supercharge creates, say, 7 psi of boost, you’re packing about 21 psi into the engine (nearly a 50-percent increase). 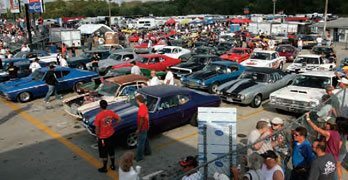 However, because neither system operates at 100-percent efficiency, you likely don’t see a 50-percent increase in horsepower. More than likely, power increases by around 40 percent. One of the ways to help maximize efficiency is to tailor the exhaust system for maximum exhaust gas scavenging. A supercharger pressurizes the intake system and flows more fuel into the combustion chamber. If your engine is fitted with a supercharger, you need to select a compatible exhaust system. While turbocharging packs additional air into the cylinders with the use of an exhaust-gas-driven compressor, a supercharger accomplishes the same task by being mechanically driven by the engine’s crankshaft. In many cases, depending on the specific engine design, a supercharged engine’s crankshaft may have a longer snout than a naturally aspirated version of the same type of engine. Additional crankshaft snout/nose length may be required in order to accept the supercharger’s belt drive. 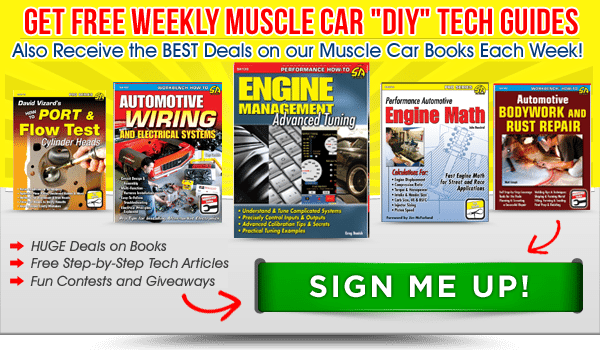 If you’re building an engine intended for supercharger use, talk to the crankshaft maker to determine if the crankshaft accepts a supercharger drive, based on the type of engine, as some engine designs may offer a short or long snout. A turbocharger uses exhaust gases to pressurize the intake system. Turbos generate heat so heat management is a top priority because excessive heat robs an engine of power. 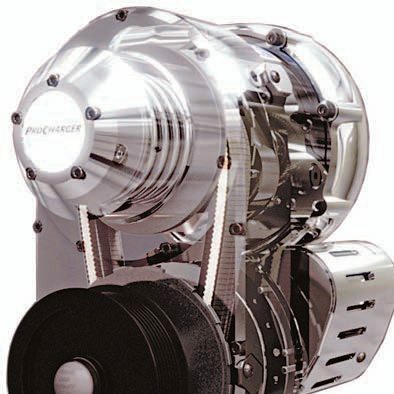 There are three types of superchargers to consider: twin-screw, Roots, and centrifugal. 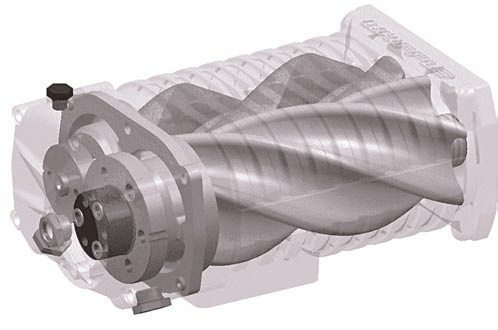 Twin-screw superchargers have a pair of intermeshing male/female helical rotors, very similar in nature to a twin-screw shop air compressor. The mated pair of high-precision matched rotors progressively compresses the air between the screws as they spin in opposing directions. The screws don’t touch each other. A tight clearance between the screws compresses the air as it is drawn from one end of the screws to the other end. A twin-screw supercharger “squeezes” the air more efficiently than a Roots-type supercharger. The Roots-type supercharger has opposing male rotor lobes inside a housing. As the lobes rotate, air is pushed between the outside of the lobes and the housing case, blowing additional air into the intake system. Twin-screw superchargers are said to produce less heat than the Roots type for a cooler air charge, but with intercooler aid this may be a moot point. The twin-screw type of supercharger is theoretically more efficient. Both a twin-screw and Roots-type supercharger mounts to the intake manifold location on the engine. The Paxton centrifugal supercharger system installed on this Ford Mustang GT provides 6 to 8 psi of boost, which doesn’t require a larger-diameter exhaust. However, increasing exhaust size on even a light-boost supercharger system may benefit horsepower. 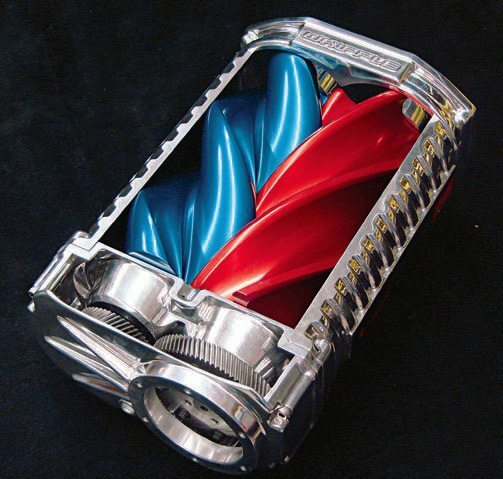 A centrifugal supercharger looks very similar to a turbocharger. Instead of the impeller being driven by exhaust gas, a belt drive is used. 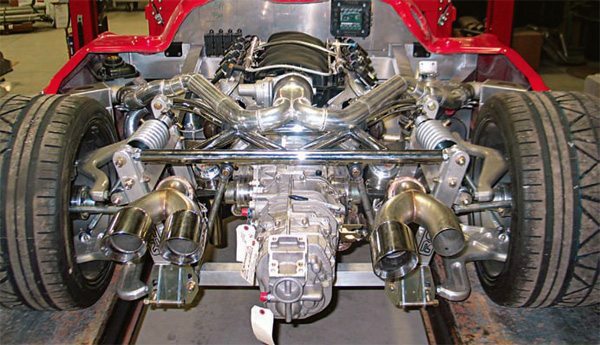 Smokey’s Dyno in Akron, Ohio, installed this belt-driven centrifugal supercharger. Today’s supercharger kits are relatively easy to install because they include all mounting hardware. Typically, little or no fabrication is required. A centrifugal-type supercharger, at first glance, looks and functions similarly to a turbocharger, in that the unit has an internal impeller. Instead of mounting in place of the intake manifold, a centrifugal-style unit is mounted anywhere at the front of the engine as long as its pulley aligns with the engine’s belt drive. This makes the centrifugal style more versatile in terms of the installed location. The impeller operates at a high speed, drawing air into the volute (compressor housing). The high air velocity has a relatively low pressure. The air travels through a diffuser that converts the air into a low-speed high-pressure charge that is forced into the engine’s air intake. 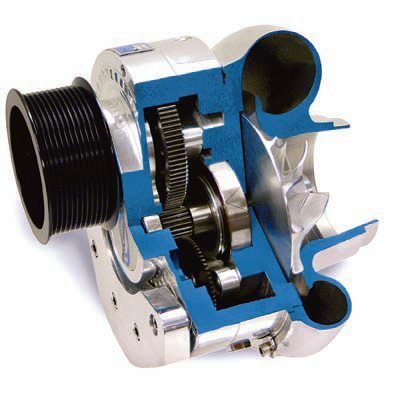 An internally geared transmission provides the increase in impeller speed. Depending on the kit design for a given vehicle, the air discharge plumbing from the centrifugal supercharger may be located between the engine’s throttle body and the intake manifold. Some centrifugal kits are designed to plumb the air charge into the throttle body, eliminating the need to relocate the throttle body. 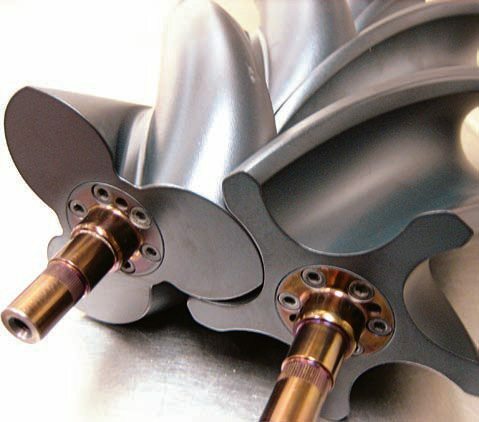 All three types of superchargers produce the same end result of packing more air into the engine, but they accomplish it by different mechanical designs. In theory, a screw-type or Roots-type supercharger produces better low-RPM power than a centrifugal type, which should produce better high-RPM power. The boost produced by a supercharger is directly affected by the size/ displacement of the engine as well as the speed at which the supercharger is driven. For instance, if the supercharger is driven at the same ratio as the crankshaft, a supercharger with a larger displacement produces more boost than a smaller blower on the same engine. In general, you should select a smaller blower for a smallerdisplacement engine and a larger blower for an engine with bigger displacement. The boost can be tuned by altering the diameter of the drive pulley in order to make the blower run slower or faster. A large supercharger on a small-block engine can be tuned by driving the supercharger at a slower speed to reduce boost, in order to prevent detonation. However, operating the supercharger too slowly can result in inadequate air compression/ boost. If the supercharger is too small, it must speed up to a point where the intake charge temperature is too high, resulting in poor air density. Packing more air into the engine requires increasing fuel delivery during boost. Depending on the amount of boost, a forced-induction system may require larger injectors and reprogramming the fuel trim by reflashing or programming the ECM. Engine timing may also require less advance, which aids in avoiding pre-ignition/detonation and permits the use of additional boost pressure. A turbocharged system requires two adjustable pressure-release valves in order to avoid over-boosting and management of pressure limits. This includes both a wastegate (WG) and a blow-off valve (BOV). 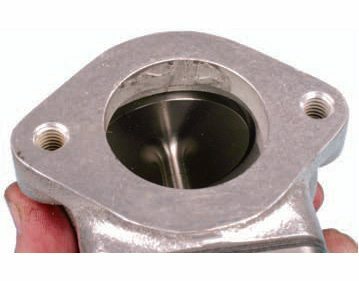 A wastegate valve is installed in the exhaust stream before the gas enters the turbocharger, which slowly opens if/when exhaust pressure exceeds a pre-set limit. This controls boost to the turbo. A blow-off valve is installed in the air charge path that runs from the turbocharger to the engine’s intake, regulating the limit of boost pressure delivered to the intake manifold. This is located in the air-charge pipe between the turbo and the intercooler. When throttle is lifted, the blow-off valve prevents forced air from being packed into the engine as engine speed decreases, protecting the engine from excess pressure when the throttle is released. 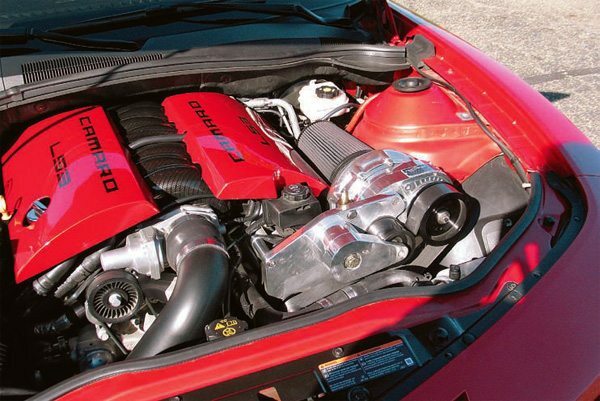 A supercharger requires the use of a bypass valve, which regulates the limit of air pressure delivered to the engine. When air intake and combustion pressure are increased by a forced-induction system, it effectively increases the engine’s compression ratio. An engine with a specific compression ratio in naturally aspirated form experiences an increase in compression ratio when forced induction is used. When building an engine that features a forced-induction system you need to consider the initial compression ratio to handle the increase that will be provided by a turbocharger or supercharger, to avoid pre-ignition, or “knock.” In the case of an engine specifically built for forced induction, lowering the compression ratio allows more boost with the same octane. An engine’s static compression ratio (CR) refers to the compression ratio of the engine without forced induction. An engine’s final compression ratio (FCR) is experienced during forced-induction operation under the available full-boost level. This wastegate valve is plumbed into the exhaust piping before entering the turbocharger on a rear-mount turbo system at Smokey’s Dyno shop. Smokey’s specializes in forced-induction installations and chassis dyno tuning. 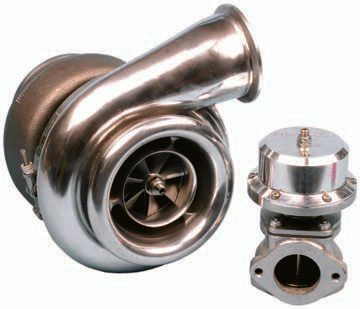 A turbocharger wastegate has a valve that remains closed when the boost pressure runs at a predetermined level. 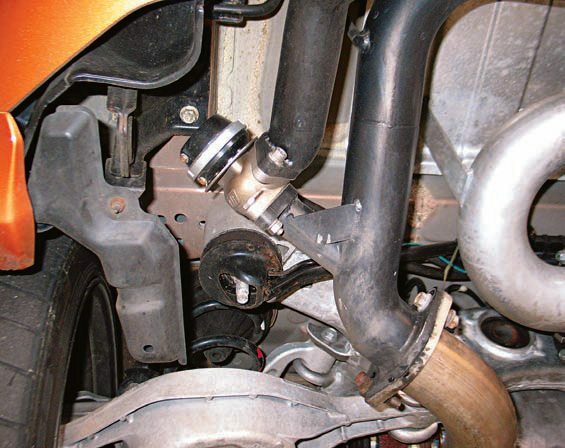 When boost pressure exceeds the pre-set limit, the wastegate valve opens, diverting excess exhaust pressure, to limit the amount of pressure that the turbo can generate. Variables of each engine build need to be considered, such as the strength of the crankshaft, rods, and pistons, but in general terms the FCR of any forced-induction engine should not exceed approximately 12:1 if the engine is to be operated on pump gas. Higher FCRs demand the use of higher-octane race fuel. For most street applications, CR should be limited to about 10:1. It’s important to understand that the amount of boost that you plan to use directly affects the FCR. A turbocharger contains a turbine and a compressor. In essence, the turbo is fed by the engine’s exhaust gas, which spins the turbine. As exhaust increases, the turbine spins faster. The exhaust-driven turbine drives the compressor side of the turbo, which serves as a centrifugal pump, and packs pressurized air into the intake manifold. This forced induction packs more air, and subsequently a greater air/fuel charge, into the cylinders than is available on a naturally aspirated engine. The greater the air/fuel charge, the more power the engine can produce. Turbocharging does not provide “free” horsepower. Because placing the turbocharger in the exhaust stream creates added restriction in the exhaust, the engine is required to fight against this added backpressure during its exhaust stroke. For this reason, a turbocharged system benefits from a larger-diameter exhaust. A turbocharger system requires the use of a wastegate, which limits the amount of exhaust pressure that enters the turbo. A turbocharger features two sections. The cast-iron section accepts the engine’s exhaust, driving an impeller. This in turn drives the impeller located in the aluminum air-charge section, producing pressurized air that is sent to the engine’s intake. The outlet of this turbocharger, where the air charge is pushed out, has a flange that allows theuse of a V-band clamp. 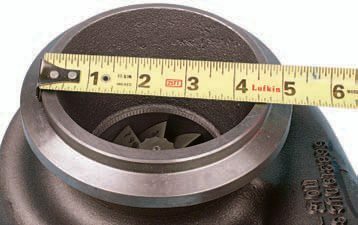 This flangeOD measures 4.125 inches, requiring the use of a matching-diameter flange for the air-charge pipe. Selecting the right-size turbo for a given application involves a number of variables. First, you need to determine how much available space you have for the turbo location, which can often be a limiting factor. 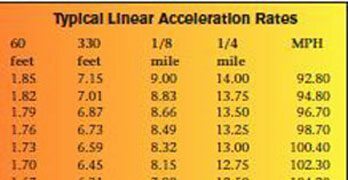 Then you need to establish a realistic horsepower goal, the maximum engine RPM range, and how much boost pressure you expect to use (which may be limited to the sturdiness of your engine’s components). One factor to consider is the turbine and compressor area ratio (A/R). A small A/R increases exhaust gas velocity into the turbo, resulting in faster turbine spin and a quicker boost. A small A/R also increases backpressure and reduces horsepower at higher RPM. A large A/R lowers exhaust velocity, delays boost time, and provides less backpressure for increased power at higher engine RPM. 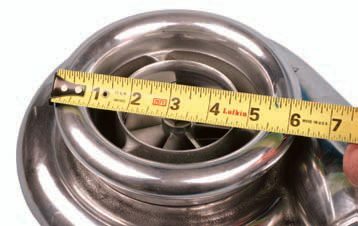 You really need to follow the advice of the turbo manufacturer when choosing turbo size. 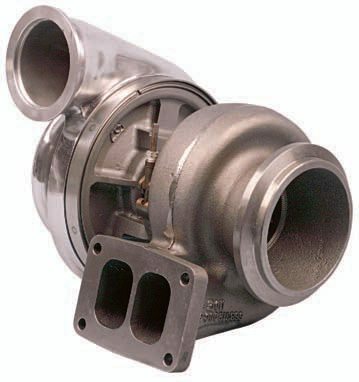 This turbocharger (size T-76) offers a relatively large exhaust diameter. This application accepts an exhaust pipe of 4.5-inch ID. The large flange lip allows the use of a V-groove clamp. 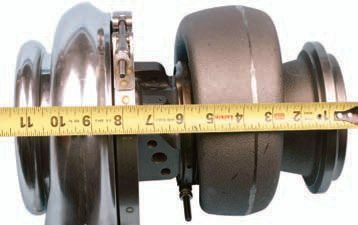 Once the appropriate-size turbocharger has been selected, measure overall width to help determine where the unit may be located in the vehicle. 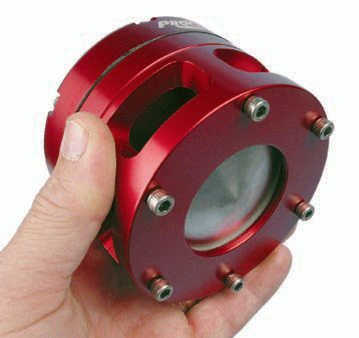 This turbocharger has a fresh-air intake “bell” that measures 6.25 inches in diameter. 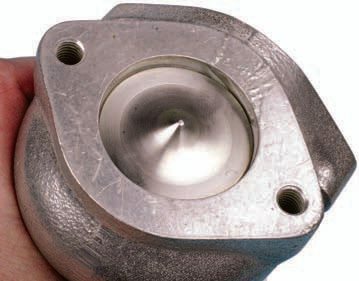 You need to have access to a source for pipe in a range of diameters (and bends) to accommodate the variety of turbo setups that you’re likely to encounter. Engine upgrades need to be considered for any build where one or two turbochargers are installed. Because of higher cylinder pressure and resulting higher temperatures, strongly consider the use of forged or billet pistons, which will withstand these increased pressures better than cast or hypereutectic pistons. Also consider taking advantage of specialty thermal barrier coatings for the piston domes, exhaust valves, cylinder head combustion chambers, and cylinder head exhaust ports. When a turbo is under boost and forces a denser charge into the cylinders, the air is pressurized. When air is pressurized, the air temperature rises. If the air temperature becomes too hot, it can ignite the charge before the spark plug fires. This is, of course, a case of pre-ignition, which produces engine knock. This is why turbocharged engines typically feature a lower compression ratio: to help compensate for potential pre-ignition. Turbocharged engines typically also require a higher-octane fuel rating for the same reason: to avoid pre-ignition. A turbocharger needs rotational time to generate boost. A small turbo spools faster than a large turbo, reducing the chance for lag. 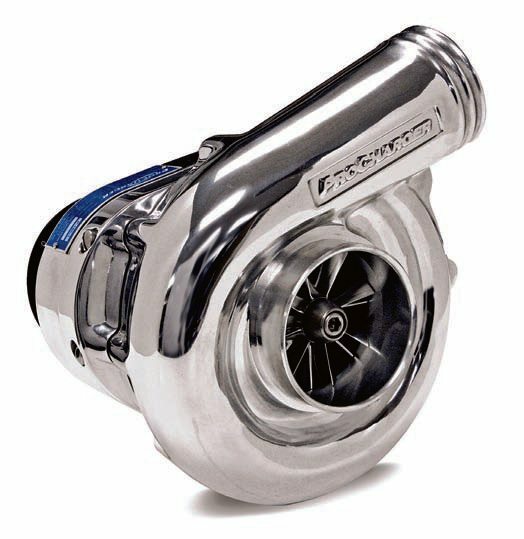 Using a smaller turbo along with a wastegate valve prevents the turbo from spinning too quickly at higher engine speeds. If you plan to increase engine horsepower by 150 hp or more by using a forced-induction system, consider potential engine upgrades that allow the engine to both perform and survive under these conditions. Appropriate upgrades depend on the engine’s existing components. For example, consider the following: If the engine is currently equipped with cast or hypereutectic pistons, I strongly suggest switching to stronger forged or billet pistons. Depending on the engine’s current compression ratio and the amount of boost you plan, you may need to lower engine static compression. Talk to the turbocharger or supercharger maker for a recommendation. If you’re going to pack in more than about 10 psi of boost, static compression may need to be a maximum of about 10:1. Also consider the use of thermal barrier coatings for piston domes, combustion chambers, exhaust valves, exhaust ports, and exhaust manifold or headers. Connecting rod bolts can be a weak link, so changing to high-tensile-strength aftermarket rod bolts is always a good move. If high cylinder pressures are obtained (through forced-induction and/or nitrous injection), serious consideration should be given to upgrading critical components, such as using forged pistons, piston rings that are designed for forced-induction, forged connecting rods, and a forged crankshaft. 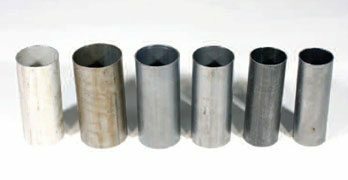 If connecting rods are currently cast or powdered metal, it’s wise to upgrade to forged rods. The same holds true for the crankshaft. If it’s currently a cast crank, moving to a forged crank is wise. Depending on the engine design, using MLS cylinder head gaskets and cylinder head studs in place of bolts may be recommended. Also, depending on engine block design, it may be necessary to strengthen the main cap system by moving to steel billet main caps and possibly adding a main stud girdle to beef-up the bottom end. If the engine is expected to rev harder and quicker, consider upgrading to higher-strength valvesprings and full-roller rocker arms, as well as upgrading the timing chain system (where applicable) to a heavy-duty double-roller chain, crank gear, and cam gear. 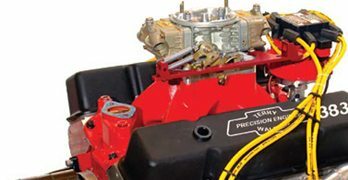 Asking an engine to produce substantially more power can place undue stress on a number of internal components, so consider your specific engine’s potential weak points, and address them accordingly. Turbocharging is a hot topic, literally. The turbocharger itself is exposed to intense heat, as are the pistons, exhaust valves, and exhaust ports. Thermal barrier coatings, available from aftermarket coating specialists, are definitely worth considering. Specifically, the turbocharger housing, the exhaust manifold, piston domes, combustion chambers, exhaust valve faces, and cylinder head exhaust ports can benefit. Why have the turbo housing, manifold, downpipe, and the remainder of the exhaust piping coated? The application of a true thermal barrier coating retains more heat inside these components, resulting in less heat transfer. This means that the exhaust component surfaces are less hot to the touch and keep the heat inside. Keeping the exhaust gas hotter, with less transfer to the outside, helps to speed the exhaust gas flow and improves exhaust scavenging. Moreover, greater exhaust gas velocity makes the turbo spool quicker. In other words, the application of effective heat retention/ thermal barrier coatings in the combustion chamber, pistons domes, turbo housing, and exhaust piping can directly aid turbo performance. For the exhaust stream, different levels of thermal barrier coatings are available. Some are more cosmetic and designed to enhance appearance, and may be as thin as .002 inch. Others are designed for function, with little regard to appearance, and can be as thick as .015 inch or more. By using applied layers of real ceramic (applied to the components in a molten state) and by using a thicker application, heat retention can be improved by as much as 40 to 50 percent. Thin coatings that emphasize appearance rather than function may only improve heat retention by as little as 5 percent. Adding a thermal wrap on the turbocharger housing serves two purposes: It lowers the temperature of the surrounding area, whether the turbocharger is installed underhood or at the rear of the vehicle. It also enhances exhaust efficiency. This turbocharger is adorned with a form-fitting thermal barrier heat shield, readily available from DEI and other sources. Swain Tech Coatings, for example, manufactures and applies all coatings in-house. Their thermal barrier coatings feature a pure ceramic content applied in layers to a substantial thickness. The only negative, if you want to use that term at all, involves appearance. Their White Lightning thermal barrier coating provides a somewhat rough, white appearance that may not be acceptable for show car folks. However, you need to ask yourself one question: Do I want to look good without regard to performance, or am I more concerned with function and increased performance? The White Lightning has a melting point of 3,000 degrees F, which certainly withstands extreme turbo temperatures. If you’re serious about performance, you shouldn’t care about color or surface texture. I’ve had many components coated by Swain and I can bear witness to the fact that the stuff works. This is not to say that other coating services can’t provide the same level of performance. Examples of other skilled coating services include Cerakote, Polydyn, and Calico. Just do your research before deciding which coating house to use. For piston domes, ceramic thermal barrier coatings are generally applied at a maximum thickness of about .002 inch. Typically, piston dome thermal barrier coatings feature a thermal barrier coating ceramic (TBC-ceramic). This is effective for any naturally aspirated application. Forced-induction, including turbocharging, supercharging, and nitrous applications, often call for a higher resistance to heat. Many specialty coaters offer a dedicated ceramic coating for turbo pistons (sometimes called a gold coat), which is applied a bit thicker, at around .003 inch. This coating is specifically designed for the extreme temperatures that are generated in a forced-induction engine. Now let’s turn our attention to the turbo system’s intercooler. For this component, you want to release heat instead of retaining it. The forced air that’s being packed into the engine needs to cool down (that’s the reason for the use of an intercooler in the first place). Applying a heat-emitter coating to the intercooler and its piping improves heat transfer. With the subject of heat management, you need to consider both heat retention with a thermal barrier coating and heat transfer using a heat-emitter coating. By applying a heat-emitter coating to the intercooler and its air plumbing, you can improve heat transfer by approximately 5 to 10 percent. For instance, if the air running through the intercooler normally is around 200 degrees F, a properly applied heat-emitter coating can pull an additional 20 degrees from the air charge, reducing the temperature to 180 degrees F.
Another option to retain heat inside the turbocharger is to consider a thermal wrap that installs over the housing, capturing heat. This lowers underhood temperature as well, in addition to retaining heat in the exhaust for improved exhaust gas scavenging. 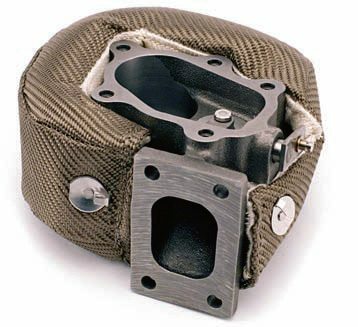 DEI, as an example, offers thermal barrier wraps and covers for a multitude of exhaust components, including turbochargers, downpipes, headers, and exhaust manifolds. Forced induction raises the exhaust gas temperature. Managing this heat affects both component durability and exhaust scavenging. The more efficiently you can pull the exhaust out of the combustion process, the quicker more air can be packed in. Since a forced-induction engine is creating this heat anyway, it just makes sense to take advantage of it by keeping it where it belongs: in the exhaust stream, instead of being soaked into the cylinder heads and pistons. Granted, a forced-induction system allows the engine to generate more power, but with that power comes a concern for the durability of various engine components. With increased boost and with the engine cranking out its maximum power, the reciprocating and rotating assembly is subjected to additional abuse. This includes the pistons, piston rings, piston pins, connecting rods, connecting rod bolts, connecting rod bearings, crankshaft and main bearings, and the engine block’s main caps. Generating more power creates a domino effect that exposes these components to added stress. In a street-driven engine with minimal boost of about 6 to 8 pounds, the concern is relatively minor. But when you begin to use boost above around 18 pounds, and start to really push the engine to generate maximum power, mechanical stresses can reach a point where piston domes fail, bearings take a beating, connecting rods have a greater potential for bending or cracking, crankshafts are more prone to failure, and main caps are subjected to potential distortion or failure. For this reason, any serious forced-induction build should consider forged or billet pistons, more durable rod and main bearings, forged connecting rods, forged crankshafts and steel billet main caps, high-tensile-strength connecting rod bolts, and higher-strength cylinder head and main cap fasteners. 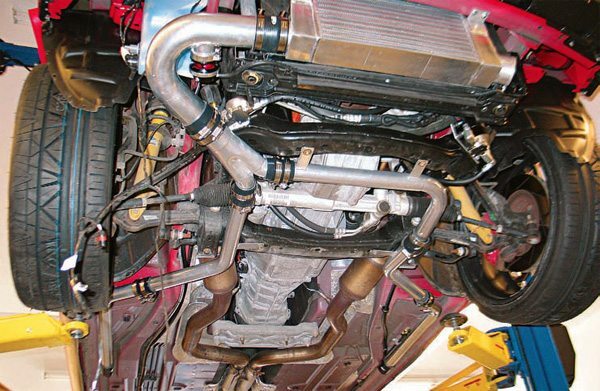 In some cases, available space may dictate the choice between cast-iron exhaust manifolds and tubular headers. The benefits of using cast manifolds include durability because they’re stronger and should be less prone to cracking. In addition, cast-iron exhaust manifolds retain more heat, even without a thermal barrier coating, which allows the turbocharger to spool more quickly. However, OEM cast-iron manifolds commonly offer a more restrictive exhaust gas path, which can be detrimental to horsepower. 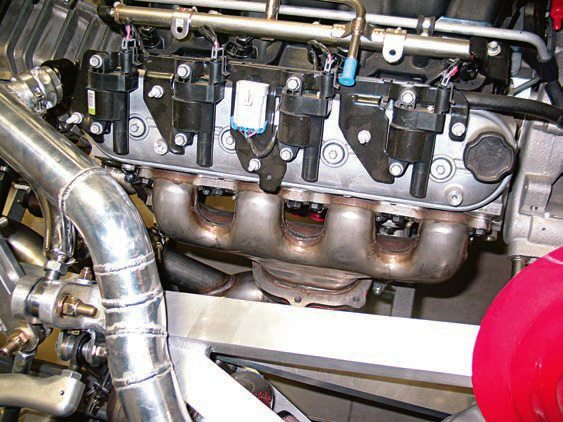 If you’re limiting the power boost with the use of a turbocharger and plan to generate no more than an additional 50 to 100 hp, cast manifolds are likely acceptable. 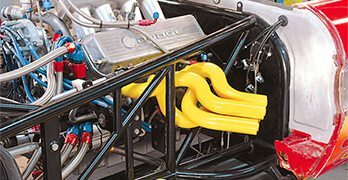 If you plan to add more than 100 horsepower by virtue of your turbo setup, you really need to use tubular exhaust headers. 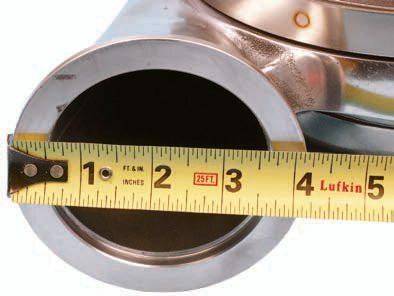 On a V-8 engine, a 2-inch-diameter primary pipe is likely the best choice. In either case, whether you opt for cast manifolds or tubular headers, it’s advisable to have them coated with a ceramic thermal barrier coating for heat retention, plus the added benefit of lowering underhood temperatures. 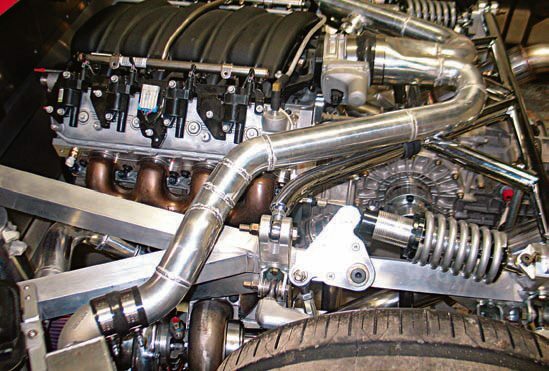 The installation of a supercharger does not require a larger-diameter exhaust pipe system, but horsepower and torque benefit from increasing the pipe diameter, generally to the 3-inch-plus range on V-8 engines. 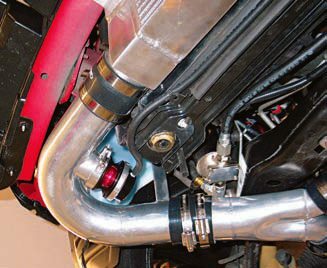 Ideally, exhaust headers should have 2-inch primary tubes, which can add around 10 hp and approximately 30 ft-lbs of torque. Granted, free-flowing headers may slightly lower the boost, but that can be remedied by slightly raising the supercharger boost through a management approach, such as decreasing the pulley diameter to make the supercharger spin faster. On the other hand, a turbocharged system does require larger-diameter exhaust piping, which is critical for both engine durability and the production of horsepower and torque. In general terms, a V-8 engine that runs a single turbo in the range of 6 to 15 pounds of boost requires a minimum 3-inch exhaust, while a twin-turbo setup exhaust pipe requires only a 2.5-inch exhaust. As you increase boost, the exhaust pipe diameter needs to increase proportionately. 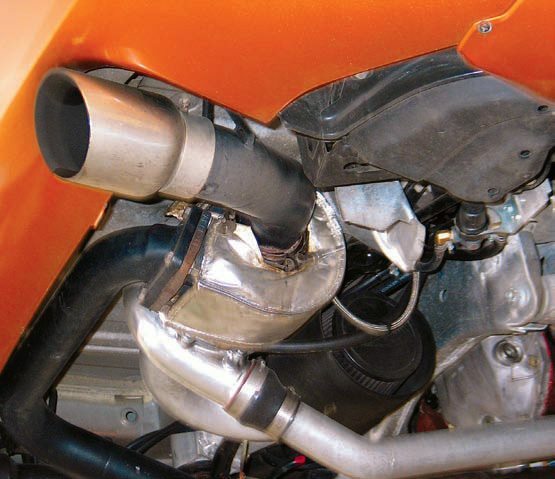 Running an exhaust pipe that is larger than necessary doesn’t hurt, but running a too-small exhaust will be detrimental to both power and the engine’s maximum RPM. 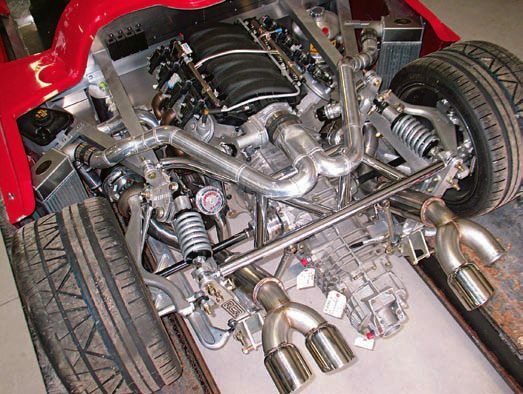 A safe rule of thumb is to run turbo exhaust piping in as large a diameter as practically fits in the available space along the chassis. 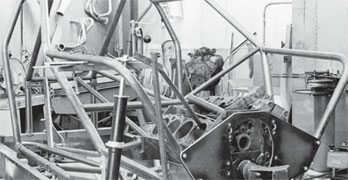 For this prototype sports racer, OEM cast-iron exhaust manifolds were fitted with turbo flanges to accept the turbochargers. Also, for a turbocharged system, it’s best to run the same-diameter exhaust pipe for the entire length, with no need to step up or down along the path. Because a turbocharger feeds off exhaust pressure to spin the turbine, the turbo needs to be placed close to the cylinder head exhaust ports. 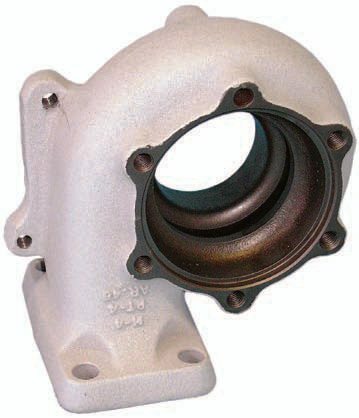 Cast exhaust manifolds designed for turbo use allow a short run path of exhaust to the turbo and provides a substantial mounting to accommodate the weight of the turbocharger. 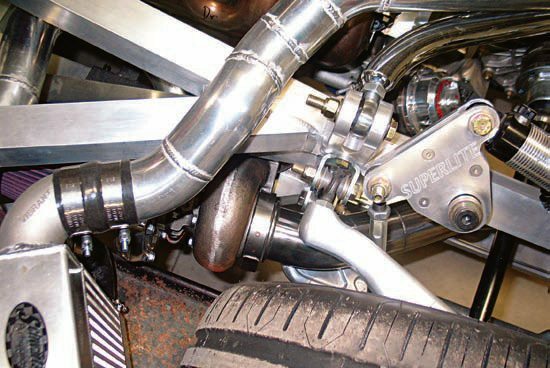 If tubular exhaust headers are employed, they should be relatively short so that they feed the turbo as directly as possible. 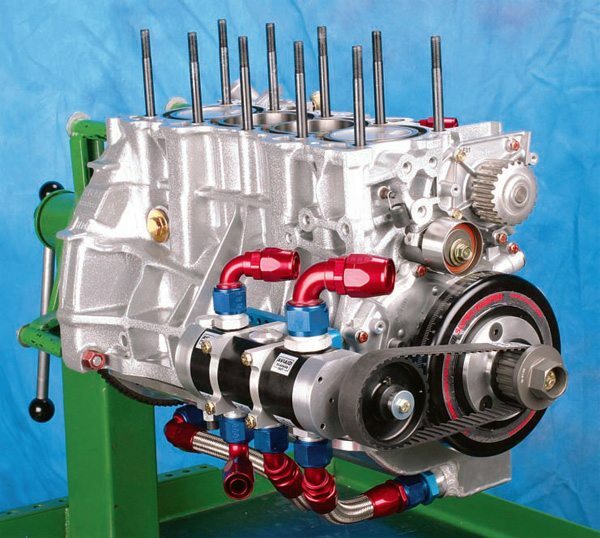 It’s common for some builders to use shorty headers installed in reverse, depending on engine type and available space. With this arrangement, the collectors aim forward to allow easier mounting of the turbocharger in the front of the engine. Because a supercharger is mechanically driven by the crankshaft, it must be mounted on the front of the engine to accommodate the belt drive. The installation of a turbcharger, however, offers a degree of latitude. Since the turbo is driven by the engine’s exhaust gas, the turbocharger unit may be located wherever space permits, as long as exhaust piping and air charge piping can be accommodated. As a result, a turbo may be installed within the confines of the engine bay or at the rear of the vehicle. 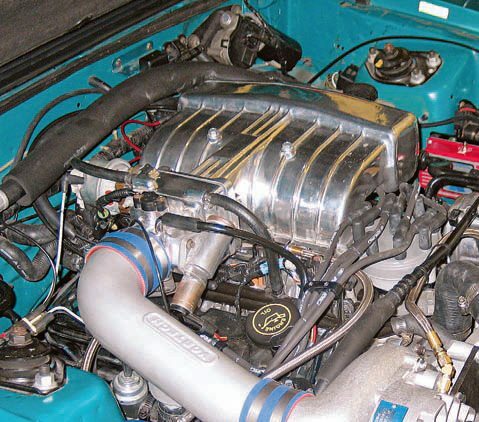 A rear-mount turbo setup is often favored when dealing with a crowded and cramped engine bay. A typical rear-mount system has the exhaust pipes running to a point behind the rear axle, with the turbo(s) mounted in a convenient location (for example, at the location of the original rear muffler(s). A fresh-air intake with an air filter is plumbed to the fresh-air intake side of the turbo. The air charge plumbing, which delivers the compressed air charge to the engine, is then routed from the turbo to the intercooler and to the intake system. Rear-mount turbocharger setups have become increasingly popular, especially where underhood space is severely limited. 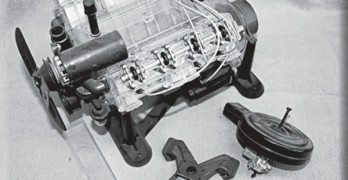 Locating the turbocharger(s) at the rear of the vehicle is often easier than trying to obtain installation space in an already-crowded engine bay. Rear mount locations also make the turbocharger(s) more easily serviced. Shown here is a single turbo installation on a Nissan 350X. Note the thermal heat shield blanket installed on this rear-mount turbocharger housing. It insulates the trunk area from excess turbo heat and enhances turbo performance. On this Nissan 350X rear-mount turbo installation, the single exhaust pipe routes through the wastegate location and into the turbocharger. The air-charge pipe runs from the turbo to the front-mounted intercooler. The large-diameter 180-degree pipe connects the turbo to its air filter (within the black air filter housing). Installing a rear-mount twin-turbo system on this late-model Dodge Charger required a minor amount of fabrication. This system was purchased as a kit, which included all mounting hardware and pre-fit piping. Properly installing the mounting bracketry to support the weight of each turbocharger was critical. The pipes that were included in this turbo kit were pre-bent and afforded a relatively easy installation. Kits can greatly reduce installation time, without needing to have pipes custom fabricated, which means that you can more easily handle the installation on your own rather than farming out the pipe bending. With the turbochargers installed at the very rear of the vehicle, no additional mufflers were needed. The turbos’ restriction serves to reduce the exhaust note. Each turbocharger on this prototype has its own intercooler. Locating each turbocharger and designing the exhaust piping presented a challenge. This 1969 Camaro is also outfitted with twin turbos. 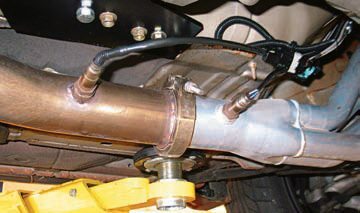 Quite often, because of underhood space limitations, exhaust headers are either fabricated or turned upside down (shown) in order to accommodate the turbochargers. The wastegates are installed between each header and its turbo. critical as the air-charge outlet from the turbo. If the air-charge pipe is too small in diameter, it can result in excessive backpressure, which can lead to oil leakage, blowby, oil smoke exiting the exhaust when off-throttle, reduced horsepower, and lower maximum engine RPM. A typical V-8 rear-mount turbo system should feature 2-inch header primary tubes, 3-inch exhaust piping to the turbo, a 3.5-inch fresh-air intake to the turbo, and 3-inch charge pipe exiting the turbo up to the intercooler. 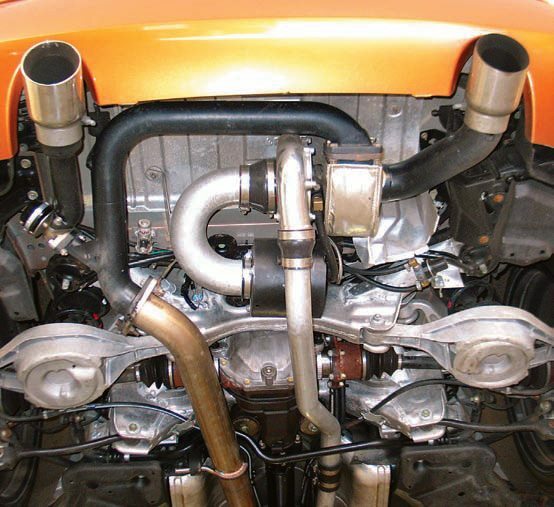 Advantages of a rear-mount turbo include reduced underhood temperatures (as compared to an underhood installation), lower oil temperature through the turbo, and, theoretically, a superior pressure differential across the turbine, as the extended exhaust lowers the outlet pressure and in turn raises the turbo inlet pressure. The pressure differential is the relationship between inlet and outlet pressure at the turbo. The exhaust gas inlet to the turbocharger is important, but not as critical as the air-charge outlet from the turbo. If the air-charge pipe is too small in diameter, it can result in excessive backpressure, which can lead to oil leakage, blowby, oil smoke exiting the exhaust when off-throttle, reduced horsepower, and lower maximum engine RPM. A turbocharger or a supercharger generates heat to the pressurized air charge that’s being packed into the engine. An intercooler is simply a heat exchanger (or radiator) that’s plumbed between the turbocharger or supercharger air outlet and the engine’s intake system. This heat exchanger lowers the air temperature entering the engine to create a more dense air charge. Lowering the intake air temperature (IAT) produces more power. This exotic mid-engine sports racer is actually intended for the street. The LS engine is equipped with twin turbochargers in a very cramped space. 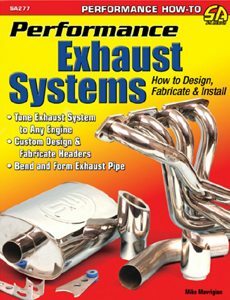 All of the exhaust and air-charge piping required custom fabrication. This one-off setup was designed and installed at Stainless Works. An intercooler accepts the compressed air generated by the turbocharger and lowers the intake air-charge temperature before it reaches the engine’s intake. A cooler, denser charge promotes engine efficiency and power. As far as intercooler size is concerned, you should choose the largest intercooler that can be fitted to the vehicle. 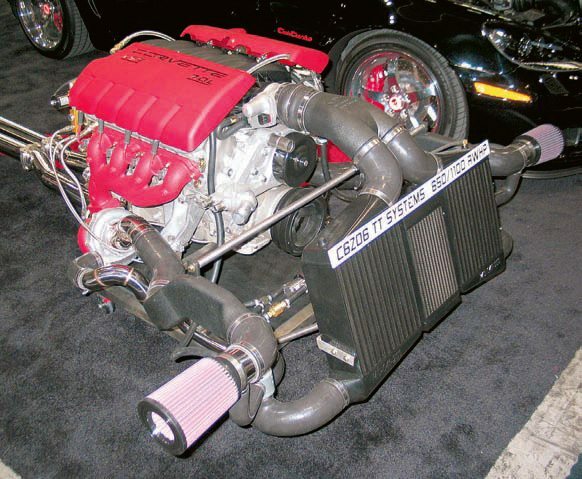 This is an example of a twin-turbo system fitted to an LS7 engine, which increases rear-wheel horsepower to 1,000 under full boost. 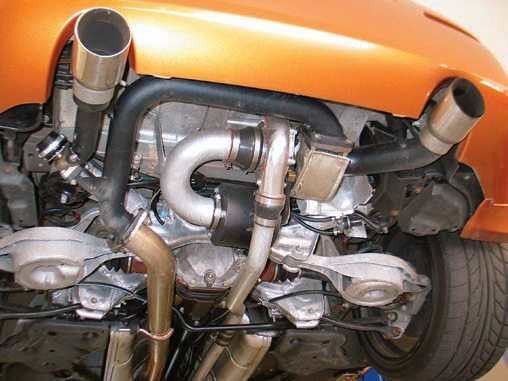 Given the installed locations of the turbochargers, custom-formed exhaust pipes are required to route exhaust from the turbos to the remainder of the exhaust system. If a twin-turbocharger setup can be installed in cramped quarters such as these, you can certainly accommodate a turbo in any production vehicle. This example is a custom-built street car that emulates an exotic road race car, featuring a mid-mount LS7 engine with twin turbochargers. 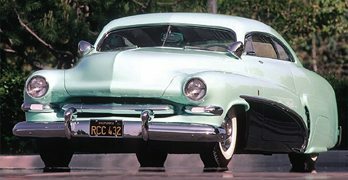 Because of the tight confines and exotic suspension system, as well as the engine/ transaxle driveline, designing the exhaust tubing presented quite a challenge. 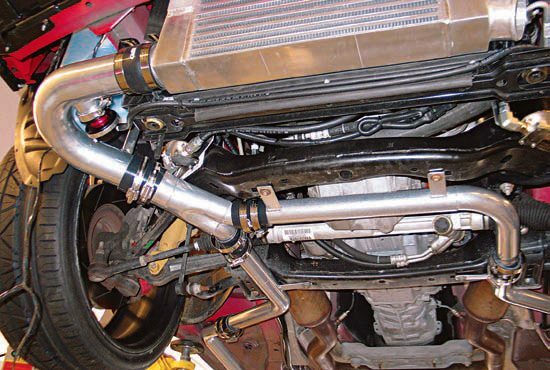 The entire exhaust system was designed and fabricated in-house at Stainless Works. 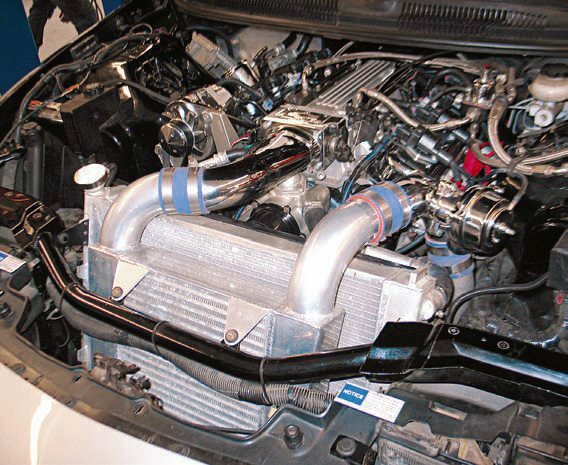 This late-model Camaro turbo system has an intercooler with both inlet and outlet air-charge pipes at the top of the intercooler, due to space restrictions. The bypass valve (on the driver’s side) limits and protects the engine from an overboost condition. 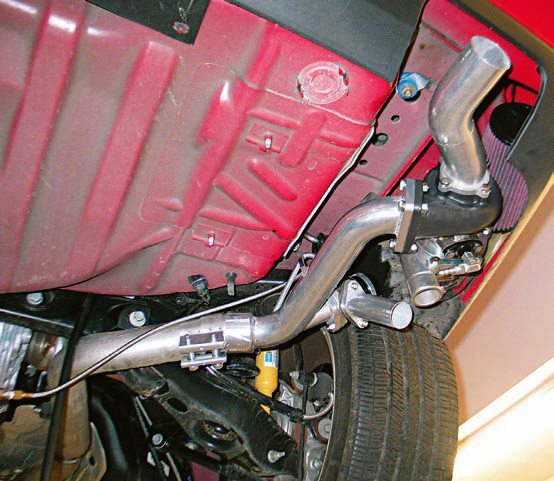 Air-charge piping routed from the turbocharger to the intercooler may be connected using high-temperature silicone sleeves, which are available in a variety of diameters, including stepped adapter sizes. The sleeves are secured to the pipes using T-bolt band clamps. How large should the intercooler be? In general, you should select as large an intercooler as fits into the available space. This is one component decision that follows the “bigger is better” approach. The air-charge piping that runs from the turbo outlet to the intercooler to the engine is plumbed in sections in order to facilitate assembly. The connections at pipe to pipe, pipe to intercooler, and pipe to intake must be secure to avoid accidental disconnection/leakage caused by separation of the connections. 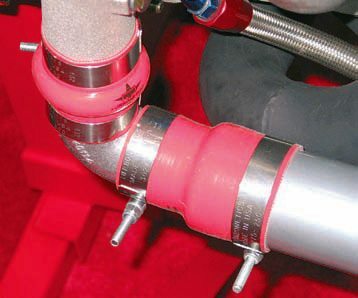 Commonly a high-temperature-resistant silicone hose is used at each connection, secured by a band clamp or a wide T-bolt clamp. These silicone hose connectors are available in a variety of diameters and shapes, including straight, 45-, and 90-degree bends. If slipping or disconnection is possible, it most likely occurs at a straight connection. To provide additional insurance against accidental connection pop off, a boost brace may be added. 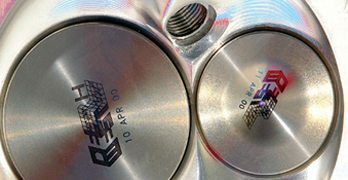 This is simply a steel, aluminum, or stainless steel brace that connects mating pipes. Adding one involves tack welding a post to each pipe on each side of the hose connection. 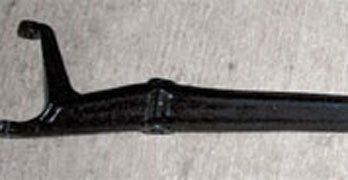 The posts are then secured together with a bolt-on or clip-on brace bar. Here, a red bypass valve is located on the air-charge pipe before the intercooler. A wastegate valve limits the exhaust pressure that enters the turbos; a bypass valve protects the engine from overboost. Providing a secure connection between the header collector flange and exhaust pipe is a V-band clamp. This type of clamp positively engages the mated flanges, eliminating the potential for pipe slipping. The sensor in the collector is an exhaust gas temperature (EGT) sensor, while the other sensor is an air/fuel ratio (oxygen) sensor. This provides tuning information to monitor both exhaust gas temperature and the engine’s air/fuel ratio. On an EFI system this information aids the ECM in regulating both fuel and spark delivery. Air-charge piping must feature smooth bends. Avoid short 90-degree bends where possible. Pipe fitting in this application was relatively easy, as the builder simply purchased pre-bent tubing in a variety of angles. Each section was trimmed to the needed length and connected with high-pressure sleeve connections and clamps. The owner of this car had the aluminum air-charge piping fabricated before the car was delivered to Stainless Works. The air-charge pipes were fabricated by welding sections to create the finished product. Turning to a custom pipe bender, such as Stainless Works, could have resulted in CNC-formed air-charge pipes with no welded segments. Vibratech’s boost brace is a good example. Each post has a ball end and each end of the brace bar has a spring-loaded female coupler that snaps onto each post ball. This is easily removed for pipe servicing. Basically, any locking system that prevents the air-charge pipe connections from slipping loose is worthwhile. For instance, you could simply weld a tab onto each mating pipe behind the silicone-rubber sleeve locations. Then secure the two tabs together with a bolt and a locking nut or by connecting the two tabs with a heavy spring. 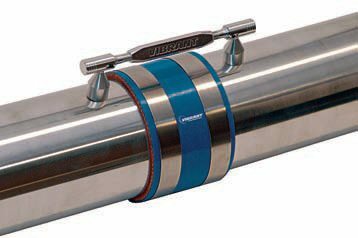 This provides a fail-safe connection that prevents the tubes from walking out of the connection sleeves when the tube is under charge pressure. The air-charge pipe should be routed to avoid close contact with potential rub locations and high-heat locations. If the piping is close to a heat source, a thermal wrap may be added to the pipe in that location.